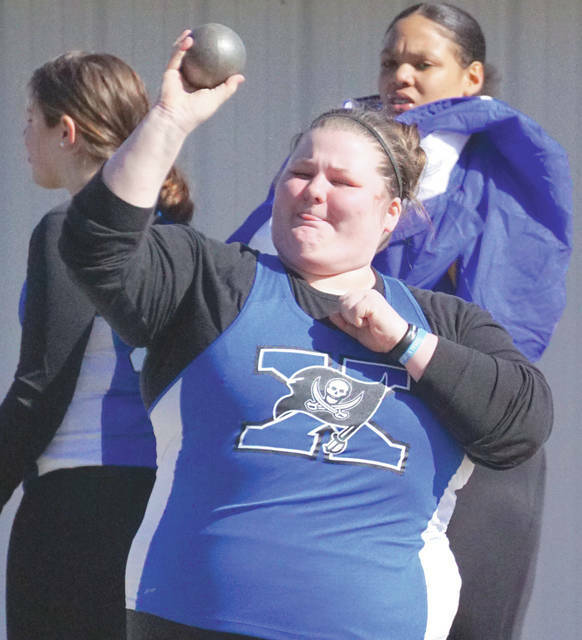 Xenia High School thrower Madie Holcomb competes in the Wilmington Field Relays event, March 23 at Wilmington High School. Cedarville at Fairlawn, 5 p.m.
Urbana at Xenia, 5 p.m.
Fairborn at New Carlisle Tecumseh, 5 p.m.
Carroll at Dayton Meadowdale, 5:30 p.m.
Bellbrook at Green (Ft. Walton Beach, Fla.), 9:30 a.m.
Bellbrook at Ft. Walton Beach (Fla.), 7 p.m.
Fairborn at Greenon, 5 p.m.
Greeneview at Xenia, 5 p.m.
Milton-Union at Beavercreek, 4 p.m.
Carroll at Cincinnati Purcell Marian, 5 p.m.
Beavercreek at Wayne Quint Meet, 5 p.m.
WILBERFORCE — The annual Central State University Marauders football team Spring Showcase will be held starting at 1:30 p.m. Saturday, April 13 at McPherson Stadium on the CSU campus. The Invincible Marching Marauders marching band will perform, and fans can receive posters of the team’s schedule. Central State looks to improve upon its second-place finish in the Southern Intercollegiate Conference’s West Division, and 5-5 overall record this season. DAYTON — Greene County area high schools Fairborn and Beavercreek are among 39 Southwest Ohio high school baseball teams who will play baseball at Fifth Third Field, the downtown Dayton home of the Dayton Dragons minor league baseball team. Fairborn will visit Fifth Third for a 4 p.m. game on Sunday, April 7 when they will take on the Edgewood Cougars of Trenton, Ohio. Beavercreek is scheduled to visit Fifth Third at 7 p.m. Thursday, May 2 when the Beavers will take on Springfield Shawnee. New to the high school baseball schedule this season is the introduction of a Most Valuable Player and scholarship winner. After each game, coaches can nominate one MVP who will be recognized immediately following the game at Fifth Third Field. Then, during the Dragons home game on May 20 against Lake County, each of the MVPs will be welcomed back to the field to be recognized in front of a sold-out crowd. One player from among the 20 MVPs will receive a $1,000 college scholarship to be presented at their respective high school in front of family, friends, coaches, a Dragons mascot and Mount St. Joseph University staff.